Harry Roberts – what sentence would he receive today? 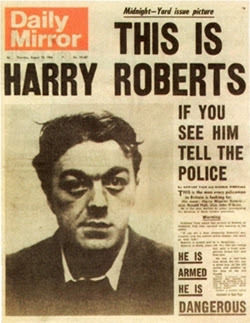 For those who do not know, the Harry Roberts we are talking about today is a man who murdered three police officers in 1966 – not the doctor who dedicated his career to helping the sick of Stepney. Ironically, it is the doctor who is more worthy of our memories but it is the murderer who dominates out thoughts. In Shepherd’s Bush, Roberts shot DC Con Wombwell, 25, in the face then shot DS Christopher Head, 30, killing both officers instantly. His accomplice shot PC Geoffrey Fox, 41, killing him too. Roberts had been sitting in a van with John Duddy and John Witney after the three committed an armed robbery. The three police officers approached the van to ask some questions when the gang opened fire on the unarmed officers, killing all three. Following the doctrine of joint enterprise, Roberts was convicted of all three murders even though he actually killed two of the officers himself. Serco, one of the Government's favourite outsourcing companies and, it seems still a suspect in an ongoing fraud investigation by the Serious Fraud Office, caused controversy recently by hiring a stretched limousine to transport a group of asylum seekers from London to Manchester. The Government says that Serco are required to use "appropriate" transport and that Serco pay the cost of whatever vehicle they buy/hire for the purpose. What does the Government mean by "appropriate"? I'd assume it means things like, "able to carry the number of people required", "safe", "able to complete the journey in a reasonable time" and so on. Why then has the use of a limo caused any controversy at all when a) it costs the taxpayer no more or less than using a coach, 10 taxis, a bus or any other mode of transport; and b) it seems to have got the job done, on time and without any problems.